Most of us parents hear that pleading tone from their child at some point asking: “Pretty please may we get a puppy? !” As such, we should all be prepared to make the correct decision for our clan. Though some of us aren’t convinced, it’s important to know that being a pet owner isn’t as rough as you may think. Pets foster family bonds, teach kids responsibility, promote physical activity, encourage a nurturing personality and provide comfort. Overall, welcoming Fido into the home can help kids become the following. As child education theorists might agree, children need the opportunity to learn things on their own. By having a family pet, your children can be encouraged to love and care for them, leading them to understand the importance of nature and the responsibility of life. Being given the opportunity to show responsible decision making can help youngsters not only understand the responsibility of life, but also develop skills that will teach them accountability and respect for animals. Being able to empathize is an important part of emotional and social development for kids. It affects behavior toward others and the quality of social relationships, especially into kids’ future years. Young children are not cognitively able to experience empathy but an early development of empathy can help a child grow into a compassionate adult. In the article Children and their Pets: Exploring the relationships between pet ownership, pet attitudes, attachment to pets and empathy, Joanne M. Williams and her colleagues say that pet ownership offers children the opportunity to engage in nurturing and caring behavior toward another living creature. This is likely support the development of empathy. Giving your children an opportunity to care for an animal (with your help, of course) teaches them the importance of responsibility and allows them to learn compassion, care and kindness toward living creatures. In today’s society, there is an overwhelming number of children who are not as physically active as they should be. Owning a dog, for example, can encourage children to go outside and play. Throwing a ball and chasing a romping pet around the backyard can truly lead, even in a small way, to a more active lifestyle. Studies of physical activity and exposure that goes into family pets and the positive effects it can have on children have been an eye opener to those looking for the positive effects of owning animals. For example, in Pets and Children, Judith J. Becerra, she concludes that “having a pet can lower high blood pressure, prevent heart disease and reduce depression. 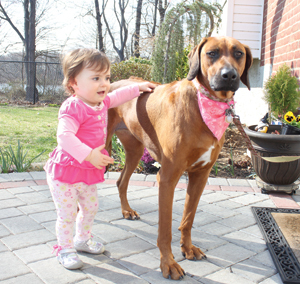 By exposing children to germs, pets may help build children’s immune systems”. Another concern is that of allergies in childhood. The study Clinical & Experimental Allergy by Lodge, C. J., and his colleagues shows that children who are raised around pets to the age of 12 have had decreased or had no effect on allergic disease. It’s important for parents to make sure children feel safe and comforted. Pets can offer the aforementioned and foster the experience of bonding. Moreover, developing a bond with a pet can teach children the importance of love, compassion and friendship. With a simple cuddle of a bunny can change a child’s mood from tears to giggles and smiles. A lick on the cheek from a furry friend can turn a frown into a broad grin. From early childhood to adulthood, these levels of emotional support from a pet can lead to better overall mental and physical health. These are the same reasons therapeutic animals are used in school settings, hospitals and nursing homes.